I have some issues with my libary. Is there a way to delete or to hide playlists which are empty? I have sync much music with my PlayMusic Cloud so if I don't downloaded the files of the Playlist they are empty in the CrossDJ App. An other issue is that my Cross DJ app is showing up some wired pictures in the playlists for each song. How can i delete the picture which are totaly random each system reboot and are pictures of my gallery [only screenshots btw] like in the picture below. You can't delete playlists in Cross DJ. 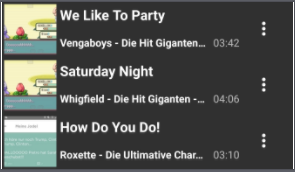 You have to go into the Google Play Music app which comes with any Android device and delete them there, and then it will no longer appear in Cross DJ. The pictures are part of the id3 tag of the track and sometimes odd pictures get randomly assigned to the files. You need a separate program to edit the id3 tag to remove the picture. There are plenty of free ones out there, just search for id3 tag editor. in my case they are not part of the id3 tag! Every other player of my phone and also my explorer and also 2 diffrent id tag editors have some other picture (the right one) for each song! That is just a Cross DJ apk issue! OK, so what is the source of those pictures? Are those pictures somewhere else on your device? There is a topic somewhere with a possible solution if I am right. Editing tags of a track isn't the way to go. i will give it a try to find the topic. Legaldeejay wrote: OK, so what is the source of those pictures? Are those pictures somewhere else on your device? RoJeC wrote: There is a topic somewhere with a possible solution if I am right. Editing tags of a track isn't the way to go.